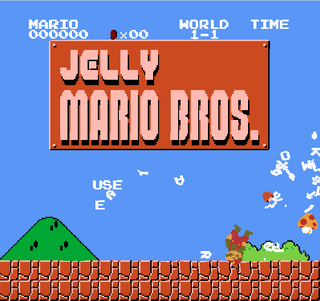 In Jelly Mario, a new browser game from programmer Stefan Hedman, something horrible has happened not only to Mario but to the entire Mushroom Kingdom. When Mario attempts one of his famously crisp and precise jumps, he floats and rotates away, his legs wriggling uselessly beneath him. When Mario collides with an enemy, no matter the angle of attack, both explode into a shower of pixels, occasionally leaving the plumber’s decapitated head to float off into the ether. Perhaps most disturbing of all, Mario no longer warps, but instead wriggles his way through pipes like an intestinal parasite. When he emerges on the opposite end, his attempts to collect coins cause them to bunch up like a swarm of terrible red blood cells, hideously distorting his face in the process. There is only one conclusion to draw from this waking nightmare: Mario has died and gone to hell—punishment for his constant sins of avarice, mushroom abuse, Koopa murder, and princess neglect. Not even Koji Kondo’s iconic theme is left unscathed, speeding up and slowing down to match the speed at which Mario floats and slides listlessly through his endless torture. The entire proceedings have the feel of an awful dream in which you could save yourself, if only you could just start moving. Unfortunately for Mario, there is no saving himself. Fortunately for the rest of us, Mario’s suffering makes for a pretty fun way to mess around for 10 minutes.